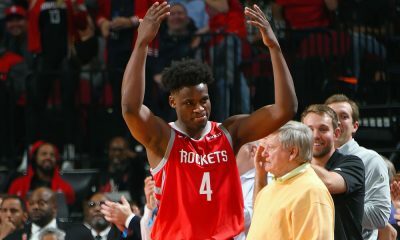 Alykhan Bijani breaks down the plays the Rockets utilize to create open shots for one of the NBA’s deadliest shooters. Nobody in the NBA has made more three-pointers than Stephen Curry to start the 2016-2017 NBA season. That’s been the norm for the last few years. However, his running mate Klay Thompson isn’t second. Neither is James Harden, Damian Lillard or Kevin Durant. 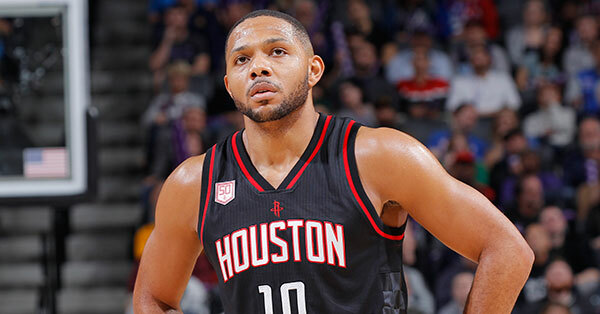 It’s Houston Rockets shooting guard Eric Gordon, who has 112 three-pointers made with just about a third of the season played. Last season, the Rockets employed a motion offense centered around James Harden’s ability to facilitate the basketball. With a combination of flare screens and pick-and-rolls, the Rockets hoisted up numerous three-pointers. However, the lack of spacing and shooting created an inefficient and ineffective offense. Enter the 2016-2017 season, with the signings of Gordon and Ryan Anderson. The pair, along with Patrick Beverley, Trevor Ariza, and Sam Dekker, are all complementary pieces and shooters, and all are shooting upwards of 38% or better on three-point attempts. 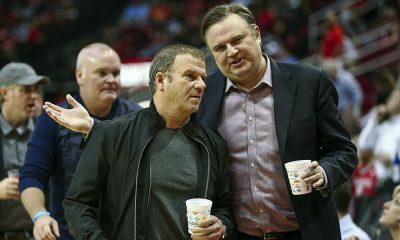 With the addition of professional floor-spacers and improvements to the offense, where ball and player movement are constantly emphasized, the Rockets have developed a potent offensive attack in which Gordon is thriving. Houston’s second-leading scorer, Gordon is averaging 17+ points per game while leading the race for the NBA’s Sixth Man of the Year. He’s also shooting a blistering 45+% from three-point range after only converting on 38% of those shots last season with the Pelicans. As Bill Worrell says, his range extends to Sugar Land, Pasadena, and other places. With his promising start to the season from three, we decided to look at the film to understand how and why Gordon has seen so much success. 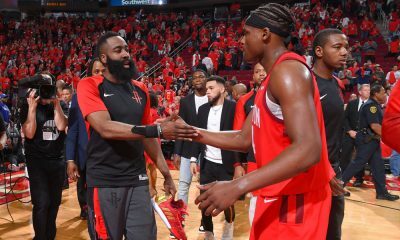 I’ll be releasing a film study soon on the Rockets “21 series” Pistol offense that will analyze the Harden/Gordon and Harden/Beverley pairings and their offensive production from this formation. Until then, here’s a preview, in particular the “21 series” Dribble Hand-Off (DHO) between the ball-handler and three-point shooter. This is where Beverley has assisted Gordon on 27 three-point field-goals. The ball handler (1) dribbles the ball towards the right (or left) corner where a shooter or wing stands. Another post or wing player stands on the elbow or high post area adjacent to the corner. If you pay close attention, it’s an isosceles triangle between the three players. What ensues is either a DHO between the 1/2 or a simultaneous screen-and-roll between the 2/4. In the case of Gordon and three-pointers, the DHO is the primary result of this formation. If he is run off the three-point line, he’ll get into a pick-and-roll with the Big at the elbow. However, as we’ll see, Beverley and Gordon have great chemistry and Patrick’s screens more than free up Gordon to get off a shot with his quick release. Beverley sets a proper screen, as he does on all DHO plays with Gordon. He has a good base by spreading his feet and slightly bending knees forward. His waist eliminates Gordon’s defender from contesting his jumper. Yes, in the play above, Lou Williams does a poor job of contesting Gordon, but many opposing defenses elect to take away the pick-and-roll threat. Teams will slide over a third defender to chip the roll man (especially with Clint Capela). However, with Gordon shooting 44+% from both wings, teams must shoot the gap and take the risk of Gordon attacking the closeout. As we’ll discuss in a later piece, that’s easier said than done with Gordon’s exceptional hesitation dribble and footwork to finish inside. 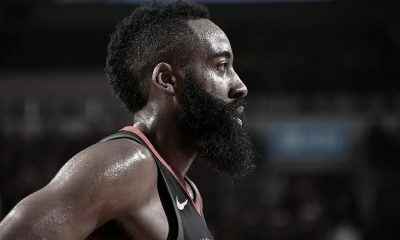 James Harden has become one of the best passers in the NBA, and his ability to connect with shooters off skip passes and cross-court passes make him and the offense incredibly difficult to guard. The San Antonio Spurs like to trap, double, or switch defensively on Harden when he runs sideline pick-and-rolls. In the scenario above, they decide to double and mitigate his drive to create penetration. Patty Mills rotates over from the help side. Once Harden begins to drive, Nene recognizes Mills and sets a flare screen. This takes away Mills’ ability to rotate back towards Gordon and now Kawhi Leonard is forced to rotate over to defend a Gordon three. It’s not quick enough for Gordon’s release, and Eric hits the three-pointer. 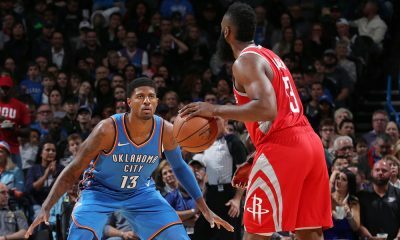 As long as defenses continue to overload the strong side to contain the basketball and pressure Harden to make a decision, the help-side defense will be vulnerable and will consistently have to be cognizant of Anderson, Beverley, and in particular Gordon. This half-court set has become a pet play of the Rockets, particularly in situations where they want to pick up the pace and score quickly. This play entails a pick-and-roll, the main component of Houston’s spread offense. It’s an especially clever play because Gordon does not start out at the three-point line. As Harden starts to cross half court, the Rockets’ Big (Nene) sets a screen on the hip of the defender. Simultaneously, with Brook Lopez staying back to protect the paint after the screener slips, Gordon sets a screen on the back of Lopez. Gordon’s defender watches Nene and is too late to get out of the way of Lopez rotating over to defend the roll. Gordon leaks out to the three-point line, gets the pass and hits a three-pointer in rhythm. Gordon’s back screen forces the opposing defense to react to the roll man. That creates mistakes and miscommunication, allowing Gordon to run out behind the arc and get a wide-open three-point opportunity. The Splash Brothers of Golden State are masters at this. Essentially a small head fake or a quick dribble to the right or left opens up the shooter to a wide-open attempt. When defenders close out with their hands up, the shooter can pump fake, make a quick dribble and lateral step, collect their balance, then launch the three-pointer. Although Gordon missed on this attempt, he’s able to regain balance and properly gather and release the basketball. His personal shooting mechanics are impeccable within the flow of the offense.ketball. His personal shooting mechanics are impeccable within the flow of the offense.